Better isn’t it? Smile on your face even? I know not everyone may experience the same joy from Christmas music as I do, but I did hear from a smart elf once ‘the best way to spread Christmas cheer is singing loud for all to hear’. Have I mentioned I’m a fan of movie quotes? It’s pretty much the only other language I’m somewhat fluent in. I feel like there should be a TV game show around speaking in movie quotes. Any producers reading this post? Yeah. Well, you know, perhaps we should just stick to the yummy stuff around here! 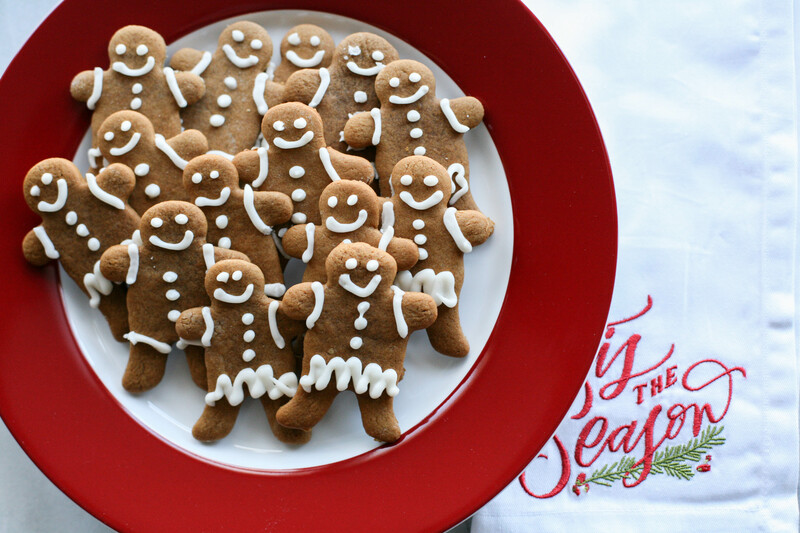 Gingerbread cookies are probably my favorite Christmas cookie of all! My Grandma and I do plenty of baking each year and even dedicate an entire day together for cookies. That’s coming up this Saturday when we’ll be baking cut out sugar cookies, gingersnaps, pinwheels and graham crackers. The graham crackers aren’t baked actually. If you’re looking for an extremely simple yet delicious “cookie” do the following: break apart graham crackers along their dotted lines, spread peanut butter on the inside of each cracker, put them together like a sandwich and dip in melted chocolate. If you leave this post now and say forget it with the time consuming gingerbread cookies I completely understand and won’t hold it against you! So yes, these cookies are a bit time consuming; however they are totally worth the time. Let me also say this recipe makes nine dozen cookies and I realize not everyone is going to be baking like their in an actual little bakery 🙂 We tend to share a good number of cookie plates throughout the season so we’ve always baked in bulk and stored our cookies in the freezer. If you cut the recipe in half, you’ll cut the time in half too. Win win! My Grandma usually had these baked ahead of time, before our scheduled baking day, but last year I jumped in to help and offered to take over the baking of gingerbread boys and girls. And guess what? I got hired full time so this is the second year of my own tradition now – baking the weekend after Thanksgiving. These cookies are delicious and just look how cute they are too! Some of mine tend to look a little goofy, but after decorating 100 of these guys and girls I’d say that’s expected. My theory is the goofy gingerbread people are even cuter! And my Mom said ‘they look perfect’ when I texted her a photo so I suppose I actually did a superb job. Thanks, Mom! Moms and Grandmas are the best cheerleaders! If you have kids, I bet they’ll give you a hand with the icing to make that part a little easier on you! So what’s your favorite Christmas cookie? I’d love to get some new ideas this year and have fun trying something different from our typical list! Or maybe you have another traditional Christmas dessert you make every year. Please share! Unless it’s a secret family recipe. We don’t want any angry Moms, Pops or Grammys’ (what I called my Grandma as a kid haha), especially if they’re Italian! The cutest addition to your Christmas cookie plate! This recipe makes 9 dozen cookies!! In the bowl of a stand mixer, combine the shortening, sugar, egg, molasses, vinegar, baking soda and salt. Once the ingredients in step 2 are mixed well, add the ginger and cinnamon. Gradually add the flour and mix until well combined. Flour your rolling surface (silicon mat, cutting board or countertop). Working with manageable sized portions of dough, flour as needed to prevent sticking and begin rolling out with rolling pin, also flipping dough over as needed. When the dough is 1/4 to 1/2 inch thick, use your cookie cutter to cut out cookies and place them on the parchment paper covered baking sheet. Repeat steps 4 – 6 until all dough has been used. In the bowl of the stand mixer, add powdered sugar, butter, vanilla and milk. Mix well. *Another option for cooling the cookies is to use a brown paper bag. Simply cut the bag so you can lay it flat and place the cookies on top. The paper bags are great for absorbing any grease. **These cookies freeze exceptionally well. If you decide to freeze yours, separate each layer with wax or parchment paper and cover the top layer of cookies as well. This entry was posted in Dessert, Recipe Book and tagged baking, christmas, christmas cookies, christmas tradition, gingerbread, gingerbread cookies, holiday baking, holiday cookie recipe. Bookmark the permalink. Mmm. Love gingerbread and especially if they are gingerbread men. Oh so CUTE! I love love how they turned out!